Notes: Ironworks were established at Consett in 1841 but in the 1860s Consett needed better access to the iron town of Middlesbrough and the neighbouring Ironstone of the Cleveland Hills. There were some circuitous rail links between the two towns but a direct route was required. The Browney valley provided the ideal setting for such a line. In February 1861 construction of the North Eastern Railway’s Lanchester Branch commenced and it officially opened the following year. It was initially a single-track line with stations at Consett, Knitsley, Lanchester and Witton Gilbert. The Lanchester Branch opened up mining possibilities along the Browney Valley. In 1870, Lord Lambton who owned land in the valley accepted an application to search for coal and the following year coal was found. The NER doubled its track in anticipation of colliery demand and collieries soon opened along the line at Bearpark, Malton, Lanchester and Langley Park. An additional station was added at Aldin Grange in 1883 and renamed Bearpark on 1.5.1927.
via Disused Stations: Bearpark Station. 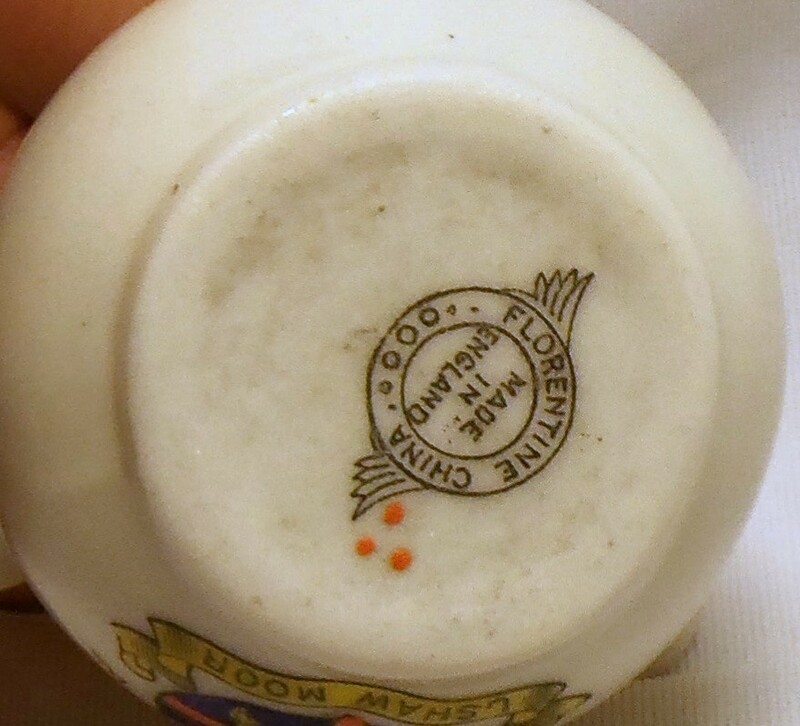 Unusual VASE – Florentine Crested China – Ushaw Moor Colliery ? 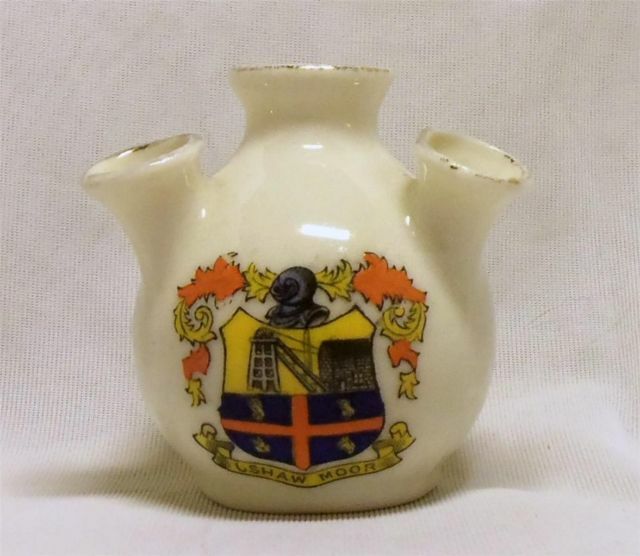 Got this lttle Gem off ebay, not sure what the significance of the Ushaw Moor crest is, maybe something to do with the Ushaw Moor Colliery. Listen to Pamela Proctor, daughter of Frank Proctor former resident of Ushaw Moor who left for Canada, remembering his story while fighting in WW2, speaking to the Royal Canadian Legion. Summary: Frank Proctor grew up in a coal mining town near Durham, England, came to Saskatchewan to work in the grain harvest, enlisted in the Regina Rifles on the outbreak of war, trained in Canada and England, landed in Normandy on D-Day, fought through France and Holland to Germany, returned to Canada and moved to Mission, B.C., where he raised his family and operated his own business until retirement to the beauty of his art. Read this gripping first hand account by a Canadian infantryman of his personal experiences in the tremendous events resulting in the liberation of Europe. via Soldier Story – I was There , an autobiography by Frank Proctor. THESE pictures show how the hard work and bravery of firefighters often goes unnoticed. But retired fireman Arthur Lockyear, who battled blazes across the North for 30 years, has penned a book celebrating his heroic colleagues. The 59-year-old from Ushaw Moor, Durham, said he felt it was something which needed to be done for the “good of the service”. And so he has written Warriors in Fireboots to tell the incredible stories of the firefighter’s calling. “The book is my tribute to the many extraordinarily courageous people whom I have had the great fortune to have met,” said Arthur, who worked in Sunderland, Gateshead and South Tyneside during his three-decade career with Tyne and Wear Fire and Rescue Service. Arthur, who has been awarded an MBE for his work organising the Sunderland Remembrance Day Parade, has spent two years gathering together stories for the book. The tales span the length and breadth of the country, and go back in time to take in the very first men who risked their lives in the fire brigade, as well as the heroic firefighters of the Blitz in the Second World War. via Firefighter tells of North heroes’ blaze of glory – Sunday Sun.